Painter Mark D. Bird honors a beloved art show event and historic neighborhood in Louisville, Kentucky with a portrait of his uncle’s “grand home” in St. James Court. Here’s how that tribute came full circle. Watercolor artist Mark D. Bird recently found himself as a central figure in a celebration of the historic neighborhood in Louisville where his family lived, and a banner year for the St. James Court Art Show, one of America’s top ten art fairs and festivals. I spoke with him about the history surrounding the area and the art show itself. AS: Why is your uncle’s home significant in Louisville, and how does it relate to the St. James Court Art Show? MB: My uncle, Malcolm B. Bird, owned and occupied the house at 1436 St. James Court in the mid-1950s. He purchased the house with his friends Bob Smith and Jim Perry. None of them had resources enough to purchase alone, so they pooled their funds…and their talents. 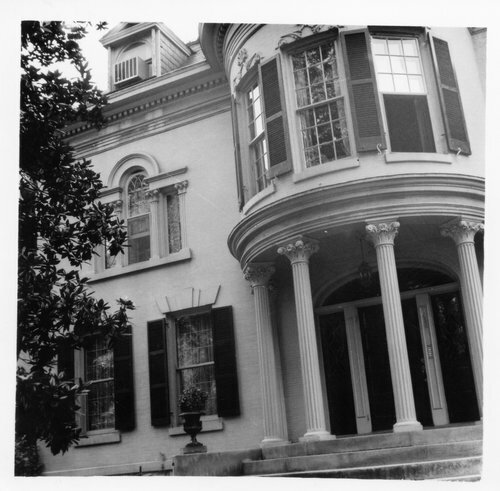 Madison J. Cawein, who was Kentucky’s first poet laureate, once occupied the home. In the period when Malcolm owned the house, it was referred to as the Cawein House. It was during this period that Malcolm’s great vision began. He and his friends transformed this house into a showplace. During the 1950s in Louisville, as in many other cities in the US, the growth in housing was in suburban areas, not in the inner city. However, that movement did not sway Malcolm and his friends. They remained steadfast in their quest to renovate and revitalize these grand homes in this neighborhood, despite all odds. The original historic home at 1436 St James Court, the subject of the painting. The homes on St. James Court were derelict, for the most part. Once these three young men turned around the house at 1436, they then went next door to 1432. At this point, their work started to be recognized and they were chosen to direct renovation work on Belgravia Court, which runs perpendicular to St. James. The homes on Belgravia were in much the same state of disrepair as those on St. James. In the end, St. James and Belgravia Courts were transformed, a neighborhood saved from demolition and the entire area designated an Historic Preservation District in 1974. Malcolm founded the St. James Court Art Show while living in the house at 1436. At the time, he was President of the St. James Court Association and faced an empty treasury, with bills accumulating for repairs of the Victorian fountain in the center of the Court, street repairs, etc. While in London with his friends, Bob and Jim, in the same period of the 1950s, he had the vision of an outdoor market, such as they visited on Portobello Road. The idea of an outdoor art show was born. The first St. James Court Art Show was held in October, 1957. In Malcolm’s papers, there is a handwritten document which states that after expenses, the first Art Show resulted in proceeds of $150.00. It was the beginning of a great idea. Malcolm Bird, founder of the St. James Court Art Show, held annually since 1957. AS: Tell us about the print. Why it was created? MB: In 1998, this painting began just as that…a painting. I produced it to honor Malcolm for all he had done to inspire me in my artistic life. When I showed it to him, he suggested I enter it in the annual competition for the St. James Court Art Show poster. I started the poster series for the Art Show with another uncle, Sonny Whittle, in 1981. Sonny and I produced (and sold out each year!) posters from 1981-1987. Our edition size was 1,000 prints, each signed and numbered. I agreed to enter this print in the competition, however, it was not selected. Malcolm and I decided it was a great painting and would make a great print, and I produced a signed and numbered edition of 1,000 pieces. It was marketed at that point with a portion of the proceeds benefiting the Conrad-Caldwell House Museum on St. James Court. I sold 750 of the 1,000 prints within a period of about 2 years. AS: What happened this summer that brought the print, the Kentucky Historical Society and St. James Court into alignment? MB: Since Malcolm passed away in 2010, I have been searching for a proper way to honor and remember him in the community. Kentucky has long had a Kentucky Historical Marker program. I submitted three applications throughout the years since 2010, and the answer was always the same: “the Kentucky Historical Society will not approve a marker application for a person who has been deceased fewer than 15 years.” I was asked if I might change the emphasis of the subject for the marker from the person, to the revitalization of the neighborhood. The rest is history. The KHS immediately approved my application for the production of a marker detailing the origins of St. James Court and its revitalization, recognizing Malcolm and his friends for their tireless work in renovating these homes and Malcolm’s founding of the St. James Court Art Show. The St. James Court Association then approved of the installation of the marker on one of the Court’s center greens, near the fountain. On Labor Day, Monday, September 3, 2018, the Kentucky Historical Society, along with local dignitaries and a throng of friends and supporters, will dedicate this marker to these fine Louisvillians. Inasmuch as Malcolm lived in 1436 St. James Court when he and his friends made all this magic happen in the 1950s, I thought it timely that the print I had produced of this house back in 1998, be re-released. The remaining 250 prints of this edition are now available through my website, and 20% of the sale of these prints will benefit the St. James Court Charitable Foundation and the Kentucky Historical Society. AS: What are you doing as an artist to gain exposure for the historic marker event and your print inventory? MB: As these events started to unfold, I could immediately see the synergy starting to develop. I called a friend who is a producer at a local broadcast TV station and explained my situation, hoping for some interest. There was no question that this story has appeal and they invited me on a live morning talk show to detail the process. The same station is arranging an interview on location at St. James Court, to discuss my history, my uncle and the forthcoming historical marker dedication ceremony. I’ve also participated in a podcast, discussing the virtues and pitfalls of the art show business and my history with the St. James Court Art Show. Additionally, I am utilizing my online presence to focus attention on this subject and market my work. I hope to bring greater awareness of the St. James Court Art Show, it’s founder, and the multitudes of people who have worked tirelessly throughout it’s long history in innumerable ways. Throughout my life, I have tried to remember the value of great ideas, and through team efforts, go above and beyond what is expected.